A fishing float tube is a handy piece of equipment for fishing by yourself on tranquil waters. The first design was a doughnut-shaped inflatable tube with a hole below the center. However, fishing float tubes now come in an assortment of shapes that allow anglers to paddle using both feet with simplicity. There are now tons of manufacturers taking part in the fishing float tube market. How do you choose one that accurately meets your standards in water? Each brand is different, so I've created a list of six to help you narrow down your catalog of potential purchases. 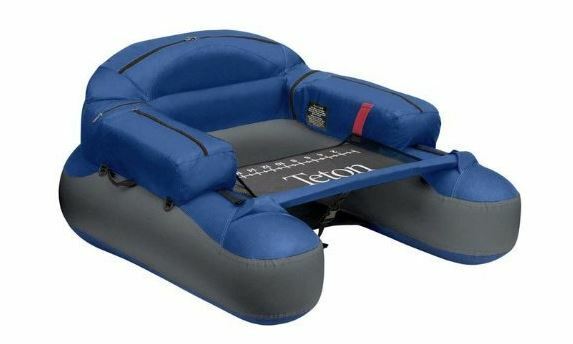 The Teton inflatable float tube from Classic Accessories measures approximately 42.5 x 40 x 18.5 inches, big enough to offer a comfortable fishing experience. Its 250-pound weight capacity can bear most anglers plus gear. Coming in at just about 9 pounds, the Teton is light enough to transport long distances; Unfortunately, no backpack straps are included to help in transport. It has a comfy backrest and seat, incorporated into the Teton's core unit. Regrettably, the Teton's hull is made from the same nylon material as the top, making it susceptible to damage. Its armrest pockets and back storage are easy to access, providing enough storage space. D-rings are added, for towing additional gear alongside the tube. Unfortunately, there are no cup holders to hold your drinks. On the other hand, it’s one of the cheapest teardrop shaped float tubes presently on the market. Like most models of the Classic Accessories brand, this fishing float tube also comes with a Velcro-attached lap stripping apron and fish ruler. The float has a hydrodynamic hull shape made from heavy-duty nylon material. For more info on the benefits of a hydrodynamic hull, check out this video here. 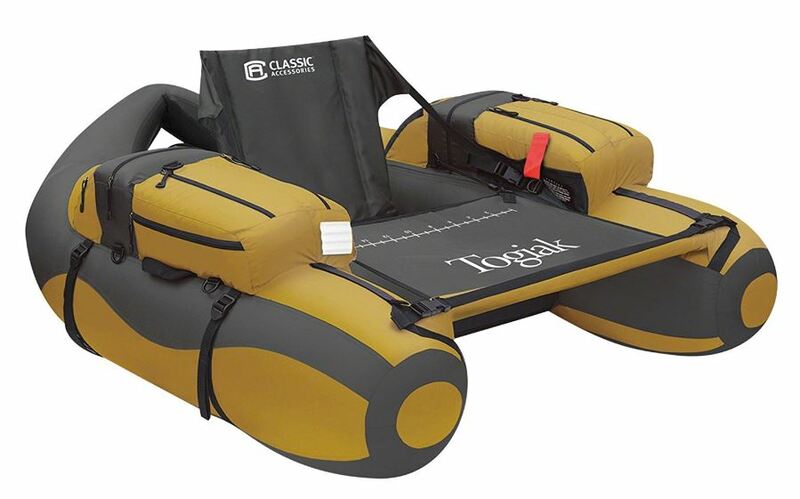 Classic Accessories pops up again on our list with a pontoon style float tube called the Togiak. 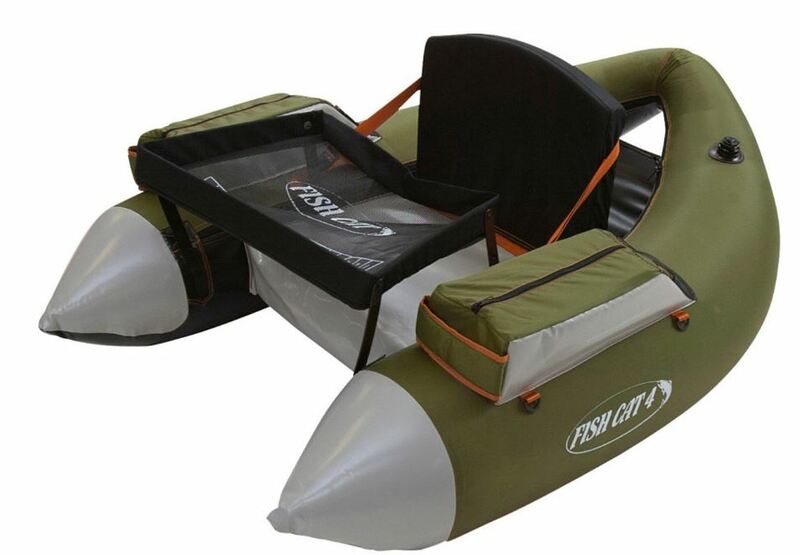 This pontoon float tube measures approximately 54.2 x 47 x 19 inches, offering plenty of space for extra gear. It comes equipped with the added support of an adjustable high back stadium seat that angler will appreciate. The hydrodynamic hull shape is perfect for maximum stability and steering. The Togiak has a 300-pound weight capacity, which is ideal for bigger anglers. At just 12 pounds, it's light enough to transport long distances using the added backpack straps. The two armrest storages and multiple pockets help keep extra equipment and gear. The small mesh and zip pockets can be used to house valuables or keys. There is a horizontal rod holder for your fishing rods. The added D-ring can be used to attach more gear. Just like other classic accessories float tubes, it comes with an integrated fish ruler on the stripping apron for extra convenience. The U-shaped Outcast Fish Cat 4-LCS uses a mixture of fabric and PVC materials, coupled with sewn seams to provide extra toughness and fortification. The air chambers are reinforced by vinyl materials that guarantee stability and puncture resistance. 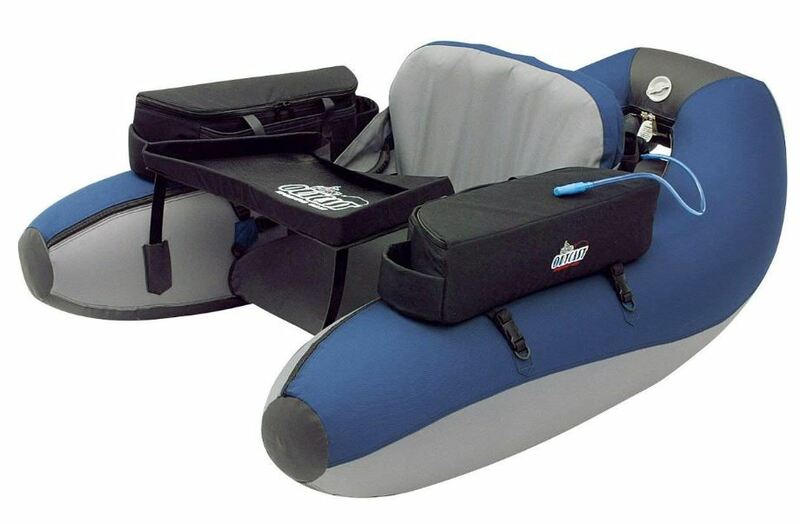 Its foam seat and high backrest allow you to sit high out of the water for added comfort. In terms of proportions, the Outcast Fish Cat 4 measures 54 x 44 inches. It weighs approximately 16.8 pounds, light enough to carry long distances with minimal gear. Its 250-pound weight capacity is perfect for carrying extra equipment. Two storage locations are included on each armrest of the Fish Cat for holding extra gear. A removable stripping apron, repair kit, air pump, fins, and boat bag is included free of charge. The basic repair kit for fixing accidental punctures is a bonus that will save you time and money. If you’re a bit taller than most, or just favor more room out on the water then you can't go wrong with the U-shaped Outcast Fish cat 5 Max. Measuring in at approximately 47 x 64 inches, it is a lot bigger than the previously mentioned Fish Cat 4, providing up to two inches of additional space. The 300-pound weight capacity is perfect for bigger anglers or those looking to carry extra gear. Not only is the seat region larger, but the Fish Cat 5 is larger, in general, to allow for improved buoyancy, stability, and control. It incorporates a foam seat and backrest to give you extra support and elevation above the water for better visibility and casting. Zippered storage compartments are included on both armrests to store extra fishing gear. A mesh stripping apron is located conveniently toward the front for easy access. There are D-loops on both sides for attaching extra bags or gear. The Fish Cat 5 is built tough for longevity and durability; rugged PVC fabric and sturdy sewn seams ensure that this float tube will stand the test of time. The U-shaped Outcast Prowler float tube incorporates inflatable seats for added comfort and versatility. It's reinforced with a fully inflatable floor that allows you to sit up and out of the water, keeping you and your equipment dry. It comes equipped with 3 air chambers made from a strong urethane material for extra protection. The valves on the Prowler are Summit II, ensuring durability and strength. A blend of fabric denier, polycarbonate, and PVC, is used in making the Prowler. The seams of this float tube are sturdily sewn, and its adjustable stripping apron is conveniently located toward the front. The left and right armrest storage compartments or the mesh net toward the back can be used for storing delicate belongings and fishing gears. This inflatable float tube can bear up to 325 pounds in weight capacity, a must-have for heavier anglers. On the other hand, the unit alone weighs 21 pounds, so it's not very portable if you decide to pack lots of gear. When it comes to measurements, the Prowler measures 64 x 50 inches, providing ample leg room if you're a bit taller than most. The U-shaped Outcast Super Fat Cat LCS fishing float tube measures in at 64 x 45 inches, perfect for taller anglers who command more legroom. Weighing in at 18 pounds, the Super Cat LCS can easily be used on long camping trips by purchasing the optional backpack straps. Regarding the weight capacity, this fishing float tube can manage up to 300 pounds of weight, making it ideal for heavier anglers or those who want to bring along extra gear. The stripping apron is perfectly crafted so that it does not decrease the space available to your legs. Two large armrest pockets are added alongside two cup holders for added storage. The backrest also includes an extra storage pocket for extra gear or personal effects. The seat on the Super Cat is fully inflatable, including the adjustable backrest. The 3 urethane-based air chambers are easy to get to via sturdy Summit II valves. Furthermore, a blend of fabric denier, PVC, and polycarbonate materials, are used in making this fishing float tube one of the most durable on the market. In addition, the welded seams ensure optimal resistance to tears or abrasions, rings and Velcro Straps offer added storage capability to mount gear and other necessities. When it comes to selecting a good fishing float tube, it's all about personal preference. Remember, your choice is what's most important. Much like buying a car, you want a design that perfectly fits your needs and capable of getting the job done flawlessly. So, since you've decided to purchase a fishing float tube; How do you figure out which one is right for you? I've compiled ten important tips to keep in mind when shopping for your fishing float tube. Choosing the right float tube shape shouldn't be difficult. Presently, the market offers four different shapes, U-shape, teardrop, and pontoon. These are three of my preferred float tube designs currently available on the market. The fourth shape, the doughnut-shape, is slowly becoming a thing of the past. I'll share core information regarding each shape below while pointing out some of the benefits and disadvantages of choosing them. Doughnut-shaped fishing float tubes are quickly becoming a thing of the past; they're hard to maneuver out on the water and they create tons of drag making steering impossible. If you're looking for something that cuts through the water like a cheetah chasing a gazelle, this is not the shape for you. The tube surrounds the angler, leaving minimal room to move, making it less than ideal for bigger anglers. Although these shapes are usually quite cheap, they aren't very portable and you'll get a workout dragging this baby to shore. My advice, just shoot for a more modern shape. U-shaped fishing float tubes are shaped just like the letter U. These float tubes are one of my favorites because of their accessibility; and when you're out on the water for a long time, getting in and out of your float tube easily is a must have. The only downside I've noticed as it regards the U-shape is that the back support is usually continuous with the entire tube, so there isn't much in the way of customization if it becomes uncomfortable. All in all, the U-shape is a great design to consider when purchasing a fishing float tube. Pontoon shape fishing float tubes look identical to pontoon boats. On each side of the seat are two cylindrical pontoons, hence the creative name. These shapes are very advantageous due to the extra room at the front and back. Like the U-shaped tubes, the pontoon shape offers the same perks in accessibility while improving maneuverability, so it's quite easy to control. Most pontoon fishing float tubes will come standard with high seating which is beneficial if you're not too fond of being submerged in the water, not to mention, you'll have farther casting distances. I absolutely love this shape because it's a lot more efficient out on the water. The teardrop shape is of a mixture between the classic U-shaped floats and the previously mentioned pontoon shape. As one of the most popular styles, the teardrop shape offers maneuverability, accessibility, and comfort at an affordable price. It features an inflated portion that comes to a point behind the anglers back, while remaining separate from the back seat. The pointed part is a lot like the bow of a boat that allows you to cut through the water while using your fins. As the cheapest shape, if you're new to fishing float tubes this is the direction to go. If you're going to be spending all day out on the water, comfort should be at the top of your list when choosing your fishing float tube. My first experience with a float tube was memorable in all the wrong ways, you shouldn't feel like you've left the gym after fishing. Make sure you get something that is comfortable! If you're shopping online pay keen attention to the seat height. If you prefer being one with the water, then a lower seat height may not bother you so much, but if you don’t want to be wet above your knees then getting a higher seated tube will save you the frustration. My personal preference is that being out of the water is a lot more comfortable. Make sure that every fishing float tube that you consider has an adjustable seat. We are all different, so having the ability to customize your seat is an added advantage. While shopping online the adjustability should be clearly mentioned, but if it's not, just paying attention to the comments section and take note of what reviewers say about the comfort of the seats. The best type of seat is always one that will keep you up and out of the water. You want a seat that leaves as little of your body submerged as possible, keeping you comfortable throughout those long hours on the water. Some of you may like an inflatable seat with a backrest more than strapped-in foam seats; it just depends on what's comfortable for you. A seat and backrest that's inflatable make for a lighter tube for packing, so that's certainly a little tip to keep in mind. Always remember that a comfortable float tube is going to allow you to enjoy fishing for long periods of time with minimal to no fatigue. Since you'll be in that seat for a long time, take the extra care to make sure that your choice is adjustable, comfortable, and suitable for all your needs. Considering your expenses when purchasing any fishing float tube is perfectly understandable, especially if you're on a fixed budget. So, choosing one in your price range should be pretty straightforward. There's no need to step out of your desired price range, more than likely, a float tube fitting your needs is certainly obtainable in your range. On the other hand, if money isn't so much of an issue you should broaden your scope and look at some of the more expensive models and the features they have to offer. Keep in mind the when you come across a float tube with a hefty price tag its mostly due to the material. So, if you happen to see one that you like with a hefty price it’s probably made from a polyurethane material for the bladder and PVC for the outer covering of the tube for added strength and durability. If that's not the case make sure you get what you're paying for. Don't pay top dollar for a tube that is just as durable as a cheaper model. If you're going to be camping and hiking then portability is a top concern. There are two features of a float that play a huge role in just how portable it is, and you certainly should be aware of them before making your purchase. Make sure to check the weight. One of the main factors determining portability is weight. If you're going to be lugging around camping gear, hiking gear, and fishing gear you should get a lightweight float that's manageable. So, make sure to check out the weight of any float you're considering, especially if you'll be lugging it long distances. When it comes to portability, always think lighter is better. Get one with backpack straps. Backpack straps are usually available on most modern fishing float tubes. This plays into the theme of weight and long distances. If you're going to be walking long distances, having backpack straps will make it a lot easier to traverse those distances without much inconvenience. More than likely you'll be carrying fishing rods, tackles, flippers, and waders so having your hands free will prove to be valuable. The only downside to backpack straps is the float will have to be fully inflated when using them. But don't worry, if you've selected a lightweight float you won't have much to worry about. All float tubes generally come with some type of storage to hold your fishing rods, tackle, flippers, waders, or the like. It's always important to take an inventory of what you think you'll be carrying with you when fishing, this will allow you to figure out the size and number of storage pouches that you'll require to fit your needs. Basically, try to picture all the gear that will accompany you, and will it fit in your choice of a float. 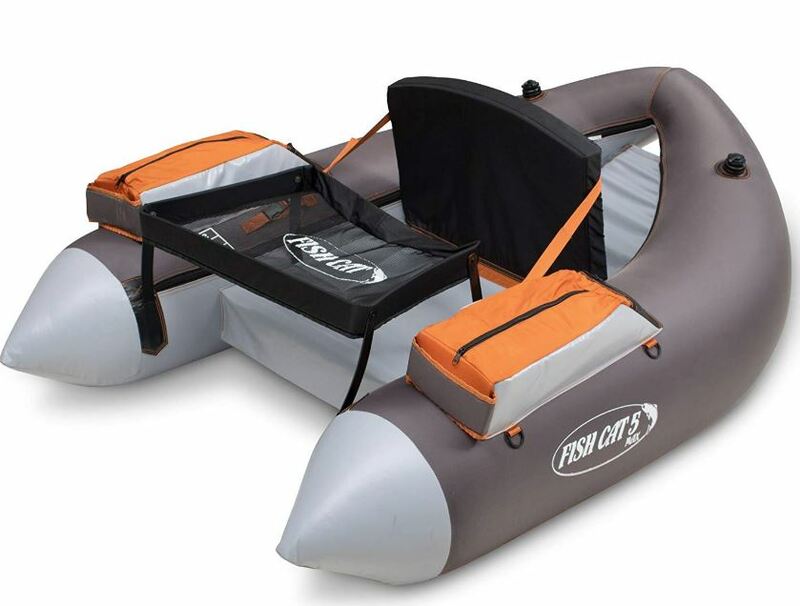 Most fishing float tubes have additional storage compartments behind the seating, providing excess space for waterproof gear or a life jackets. If you're like me, you prefer to enjoy a cold beverage while on the water; some float tube models include cup holders for extra space to safely store your drink while casting or reeling in your catch. A user-friendly fishing float tube must be considered before purchasing. You may find some easier to use and assemble than others, but you want to make sure to find a fishing float tube with inflatable seats and backrest for simple assembly. When put in place, theses inflatable seats will be better at keeping you above the water, which most anglers prefer. Round shaped tubes are a lot more difficult to get in and get out of since you're basically stepping into a nicely formed doughnut. U-shaped boats and teardrops are a lot easier to get into because of the gap in the front. Pontoon boats are not as difficult to enter and exit but keep in mind that on a level of 1 to 10 they're a 9 when it comes to assembly. Durability is an essential part of choosing a good float tube. Chances are you'll encounter conditions that can adversely affect the longevity of your tube, and a strong jacket with an underlying bladder beneath it will save you ton's of cash in unnecessary repairs. When it comes to the jacket, also known as the tubes skin. This protects the bladder of your tube from any abrasions or tears, so it's important to examine the seams and air valves to ensure that they're built to last. Good models will have both glue and stitch to ensure maximum security on the valves and seams. You should carefully inspect the bottom of your float tube as well, just to make sure it's made out of a strong PVC material or a polyurethane mix for added protection. Underneath the tubes skin is the bladder. Most bladders are made out of a mixture of vinyl and PVC, so they're pretty durable. These materials will offer protection from temperature changes and UV rays which can cause brittle areas on your fishing float tube and eventual leakage. When it comes to the best material that you can choose for your fishing float tube to avoid tears or abrasions. You want to single out those brands that use Polyurethane, it’s the Rolls Royce of bladder fabric. Be aware that Polyurethane tubes do come at a higher price. The more widely used PVC is still a very solid option, offering strength and durability for a fraction of the cost of Polyurethane. Regardless of the fishing float tube that you choose, you're going to need waders and a pair of fins. Don't even think about using any sort of paddle, unless you don’t mind going around in circles all day. If you're not Shaq sporting a pair of size 22 feet, you'll need fins to move through the water efficiently, and waders to keep algae, debris, or leeches from coming in contact with your skin. Trust me when I say this, it's not a pleasant sight to see leeches clasped onto your skin as if they're long lost friends. Do yourself a favor and pick up some waders to avoid the unsightly scene. The name of the game is catching fish. Float tubes require you to paddle with your fins, so you want a tube that’s going to make as little noise as possible. This means more fish and a less frustrated you with more hair. You want to eliminate excess noise, choose tubes without hulls, the only movement underwater will be from your legs, which will create as little commotion as possible. Just like anything in life safety is important, and it's a pertinent part of purchasing a fishing float tube. It's quite possible to flip upside down once inside of your float tube and if you don't have a way to quickly detach the stripping tray, this can lead to drowning. Keep in mind that this is more likely to happen to taller anglers, so please be wary of the fact when purchasing your tube. This problem can be avoided by purchasing bigger float tubes which are a lot heavier and less likely to flip, but these are also pose portability issues. Safety trumps portability. Remember to always anchor all non-floating tackle or excess rods to your tube. This seems to be the main cause of flipped tubes because anglers are reaching for gear that they've dropped overboard. Another safety concern to keep in mind when choosing your tube is that U-shaped, doughnut, and teardrop shaped tubes don't behave as well as pontoon boats when faced with rough conditions. If you're going to be fishing in conditions where the weather can quickly take a change for the worst, you want to consider choosing along the lines of a pontoon boat. Something else you might want to consider is to choose a float tube with multiple bladders. If your fishing float tube only contains one bladder and you spring a leak while on the water, chances are you're going to sink. The good news is that most tubes come standard with multiple bladders to avoid the risk of sinking, just make sure to check that your choice does have a multiple bladder system to keep you above water while you make your way to shore. What are the lightest fishing float tubes for backpacking? A Inflatable float tube equipped with an inflatable seat and backrest is going to be the lightest overall. If you're planning on using a backpack for transport, the nearly extinct doughnut-shaped tube is my favorite. Today's U-shaped and teardrop shaped tubes have dimensions that can fit into a large backpack amidst other gear. What is the best type of seat? A good seat is one that's going to limit your contact with the water, keeping you comfortable during the long hours you'll spend on the water. From time to time an inflatable seat and back rest is a lot more comfortable than a foam seat that's strapped in. It really depends on your weight and comfort zone when selecting the perfect seat. An inflated seat and back rest is susceptible to more wind but sometimes makes the tube lighter for packing. What is the best bladder material? The bladder is the lining underneath the outer cover of your tube. You want to choose a polyurethane material for a bladder, but be aware that it carries a higher price tag. Nonetheless, the more commonly used PVC is still a solid option that doesn’t increase the cost of the tube beyond your budget. What's the normal price for a fishing float tube? Regardless of the design that you choose, float tubes range anywhere from over $100 to $300. If you happen to notice one that you really like that costs more than $300, please be sure to keenly look at its build and included accessories. There's a good chance that the tube is made from a more durable material, such as polyurethane or PVC, which is the reason for the hefty price tag. How stable are fishing float tubes? Inflatable fishing float tubes are usually wider than regular boats, making them more stable. The wider base offers extra stability and security when compared to regular boats such as kayaks, rafts, dinghies, and the like. What if I need to buy extra parts? Extra parts can be conveniently purchased from the manufacturer or the store you bought the tube from. You can also find a lot of the spare parts for the most popular tubes online using Amazon. How can I protect my tube from punctures and other wear and tear? To make sure that your tube avoids any punctures, you need to keep limits in mind. Putting a cheap and small inflatable tube into a strong river will have an unfavorable result. If you know your tubes limits, you’ve already decreased your chances of a puncture by half. Make sure that your tube is inflated according to the instructions to avoid any creases or damage. Inflating your tube to its highest PSI can put a huge amount of pressure on creases, which will eventually cause a puncture. Be sure to avoid leaving your tube in harsh weather conditions. If it’s too hot outside, it wouldn't be wise to let your inflatable just hang out in your driveway. Same thing goes for cold weather, leaving it out during the winter is just asking for a headache. Make sure to check around your valves once in a while for leaks or small tears, as these areas are known to be problematic. What happens if my float tube gets a leak? Can I repair it? Often, you’ll be able to repair the tube by your lonesome. If it’s a small pin hole it’s a matter of using some water proof glue to adequately cover the hole. If it's a bigger hole, you’ll have to dry the area and apply water proof glue and a patch over the hole. This is a very delicate and time-consuming process if you've never done it before. If it’s a tear, you’re better served contacting the maker or bringing it to a repair shop capable of fixing it. Hopefully, after looking over this article you feel a lot more comfortable when it comes to choosing a fishing float tube. All things considered, these 6 best fishing float tubes are worthy to be considered as the best currently available on the float tube market. Float tubes are on the rise as one of the more enjoyable ways to fish, partly because they remind us of the inner tubes we floated on as children in the river. In terms of portability, a float tube is a lot easier to move around than a conventional boat, making it a great alternative for anybody who travels long distances to get to the water. Due to their compact design, they’re also capable of accessing areas of the water that otherwise may be off limits to regular water crafts like boats. The cumulative effects of portability and compactness allows you access to better fishing spots, you'll be floating along, paddling with the fins on your feet, just enjoying your time on the water. Always keep in mind to select a tube that’s functional and comfortable for you. Ensure that when you’re out on the water enjoying yourself, safety is a top priority. There's no better way to enjoy your time in the water than on a fishing float tube. Hopefully, this list of fishing float tubes can help make this process more manageable and you can go on with fishing.